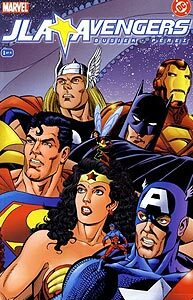 Brief Synopsis: A crisis across dimensions leads to a confrontation between the Avengers and the Justice League. Issue Notes: Booster Gold does not appear in this issue, though an advertisement featuring Booster Gold does. This issue is an inter-company crossover between DC Comics and Marvel Comics. Story Notes: The title of this story is a reference to a Marvel Comics series notable for the first appearance of the Avenger Thor. Issue Reprints: This issue was reprinted in JLA/Avengers. 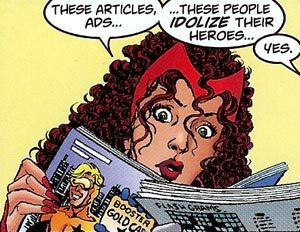 PRODUCT PLACEMENT: Booster Gold appears in an advertisement on the back cover of a magazine held by the Avenger Scarlet Witch. Booster is wearing his Mark XI power-suit and advertising the "Booster Gold Card" credit card. This is the only appearance of Booster Gold in this issue.